Two cancer-fighting initiatives come together this year at The 2014 ESPYS to join forces in the battle against the disease. 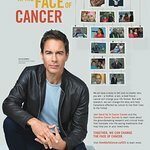 ESPN has announced that The V Foundation for Cancer Research and Stand Up To Cancer (SU2C), a program of the Entertainment Industry Foundation, will collaborate on grants for research scholars working within an emerging scientific field known as convergence, a new model of research meant to spur innovation in new ways of combating cancer. A highlight of ESPY Day – a vision of former ESPN President and V Foundation board member George Bodenheimer – will be the special announcement of the collaboration during The 2014 ESPYS by Robin Roberts. Roberts, who was honored with the Arthur Ashe Courage Award at The 2013 ESPYS, has publicly battled cancer and has received wide recognition for inspiring others who are continuing to fight each day. The 2014 ESPYS, hosted by Drake, will be televised live Wednesday, July 16, at 9 p.m. ET on ESPN from Nokia Theatre L.A. LIVE in Los Angeles. This is the first time The V Foundation and Stand Up To Cancer have worked together. SU2C is investing $4 million in the grants program. “The donation stemmed from the jointly-held visions of both The V Foundation for Cancer Research and The Entertainment Industry Foundation’s Stand Up To Cancer initiative to discover and fund scientific breakthroughs that can end cancer’s reign as a leading cause of death,” said Lisa Paulsen, a co-founder of Stand Up To Cancer and president & CEO of the Entertainment Industry Foundation. “By working collaboratively with The V Foundation, Stand Up To Cancer will help expand investments in new and innovative research efforts combining expertise from several scientific areas aimed at understanding, controlling and treating cancer,” said Sung Poblete, Ph.D., R.N., president & CEO of Stand Up To Cancer. This year, ESPN is also expanding its 21-year effort to help find a cure for cancer with a day-long fundraising drive across multiple platforms called “ESPY Day Benefitting The V Foundation for Cancer Research.” ESPY Day will begin at midnight on July 16 with integrated fundraising messaging across ESPN networks culminating with a special simulcast of the ESPYS on ESPN2 at 9 p.m. Some of these funds raised will support future SU2C-V Foundation Convergence Scholars grants. The simulcast will include fundraising elements and heavy social media integration of the hashtag #DontEverGiveUp, inspired by Jim Valvano’s iconic speech at the 1993 ESPYS.